Speed is one of the most important attributes a hockey player can possess. True hockey speed is comprised of two elements: Skating Power (see our video on skating power) and Foot Speed (which includes agility). 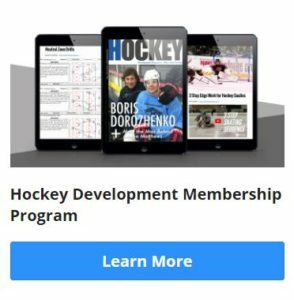 A player will not reach his full skating potential until he has achieved both. 1. Player starts on the face off dot. 2. On the whistle he explodes to the edge of the circle, pivots and skates backward along the LEFT side of the circle to about the middle of the circle, and stops. 3. 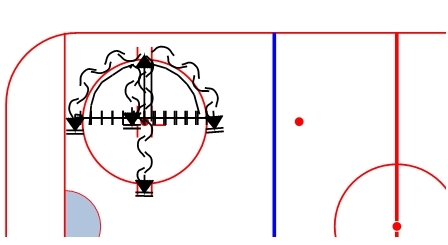 Player then skates forward along the same edge of the circle until he comes back to the top of the circle again, then pivots and skates backward to the dot, and stops. 4. Player executes side-step-crossovers to the left edge of the circle, stops, side-step-crossovers all the way back across to the far right edge of the circls, stops, then side-step-crossovers back to the dot, and stops. 5. Player again explodes to the top of the circle, pivots and skates backward along the RIGHT side of the circle to about the middle of the circle, and stops. 6. Player then skates forward along the same edge of the circle until he comes back to the top of the circle again, then pivots and skates backward all the way to the bottom edge of the circle. 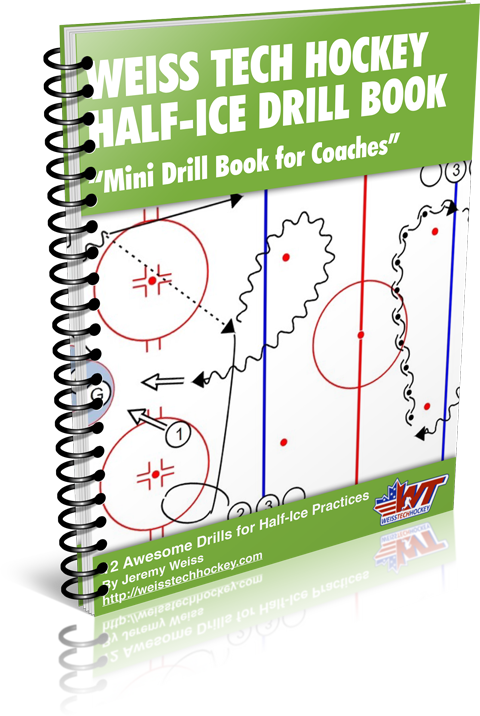 Notes: Try putting 3-4 players per circle, and rotate through until each player has completed the drill 3 times. As players’ skating skills improve, add a puck.